In late August I posted about chronic illness and some super inspiring influencers who are creating a community for those impacted. Soon after that, Alex from Cerebral Palsy Guidance reached out to me and we talked about how important it is to have a community not only centered around common challenges, but also to seek out groups of people who share the same love of activities. As you may remember, I wrote about how I began incorporating yoga into my workout routine and how much being able to hop on YouTube to look for resources changed the game for me. Alex told me how adaptive yoga can provide awesome benefits for those with Cerebral Palsy and I am so excited to share his message here. 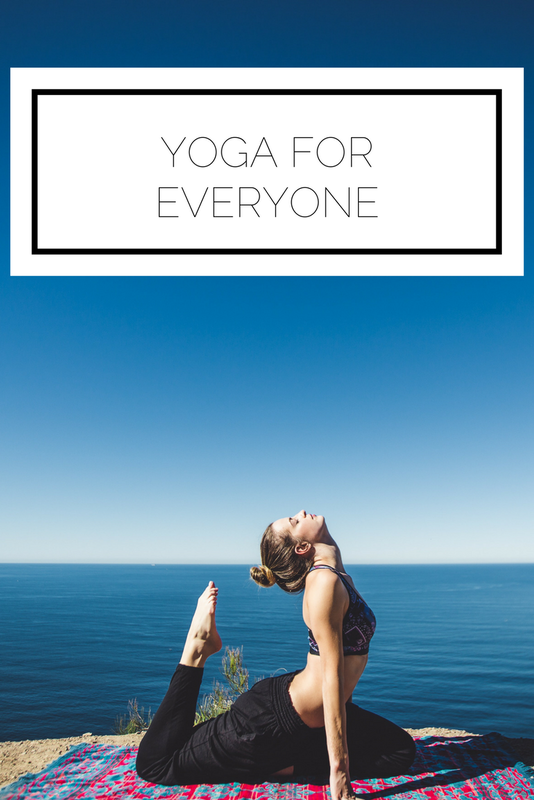 Read on for more info on adaptive yoga and to see some of my favorite yoga resources. The ancient practice of yoga has been embraced by western cultures because of its benefits for mental and physical health. It is a spiritual, mental, and physical practice, but it is not just fit and healthy people who can enjoy and benefit from yoga. Children and adults living with disabilities, such as cerebral palsy can get a lot out of adaptive yoga. And yoga instructors can add to their rosters by learning how to adapt poses for those who can benefit so much from it. Cerebral Palsy is a common disability caused by brain damage at an early age, often in the womb or during childbirth. Individuals can have any combination of a number of symptoms or complications, ranging from mild to severe, but all have some degree of disability related to muscles and movement. Cerebral palsy can cause tight, over-toned muscles, poor range of motion in joints, under-toned muscles, spastic movements, tremors, limited mobility, inability to walk, and muscle and joint pain. Treatments and therapies help improve mobility and lessen pain, but cerebral palsy is not curable. Yoga is great for flexibility, strength, and even moderate cardiovascular exercise. It also helps improve mindfulness, reduces stress, and lowers blood pressure. For someone living with the mobility issues caused by cerebral palsy, yoga can have more specific benefits: developing strength in specific muscles, stretching the spine and relieving pain, improving mobility in specific joints and in general, and relieving stress. For someone with a physical disability, doing yoga as it is intended is not necessarily possible. It is, however, possible to adapt yoga. The poses used in yoga can are adaptable to a wide range of special needs and physical limitations, from using foam bricks and bands, to adapting poses to a sitting position so that even those who cannot stand can benefit from practicing yoga. American Academy for Cerebral Palsy and Developmental Medicine. The AACPDM offers a range of resources for people with cerebral palsy, including resources and adapted poses for teaching and practicing yoga. National Center on Health, Physical Activity, and Disability. NCHPAD is a national organization that offers a range of resources for people with disabilities who want to be more active. It also has an extensive set of videos on adaptive yoga, specifically designed to be used for children with cerebral palsy. Disabled Sports USA. Disabled sports USA offers resources on a variety of sports and activities that are adapted for people with disabilities, including cerebral palsy and yoga. Integral Yoga Institute. Several organizations that offer courses and training for yoga instructors include specializations, such as adapted and chair yoga. These courses give instructors the option to diversify what they offer to students and the people they can reach. Yoga is a powerful way for anyone to gain flexibility and strength while reducing anxiety, stress, and pain. Those with physical disabilities don’t have to be left out of the benefits. With adaptive yoga, nearly everyone can get involved in this ancient spiritual and physical activity. In addition to the resources shared here, I also wanted to point out some of my favorite yoga videos. For when you want to sweat. A lot. For when you want to be stretched out quickly. For when you want to challenge your balance. What sort of yoga resources do you use? Have you ever done any adaptive exercising? What do you do to relieve stress and recenter?